Master the content from your textbook with this helpful study tool! 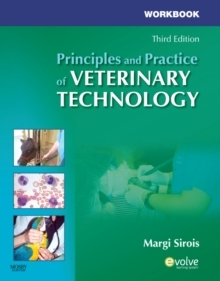 Corresponding to the chapters in Principles and Practice of Veterinary Technology, 3rd Edition, this workbook helps you understand and apply material with exercises, games, review questions, and more. Learning activities include definitions of key terms, comprehension exercises (short essays), matching questions, photo quizzes, completion questions (fill-in-the-blank), multiple-choice questions, case presentations, clinical applications, word searches, and crosswords puzzles. Chapter objectives match those in the textbook to help you focus on important concepts and understand how the material applies to the veterinary clinic setting.